Will the Global Market Crash of 2018 be the Beginning of the Greatest Financial Crisis the World Has Ever Seen? The global selloff erased $5 trillion from stock and bond markets in October alone! October is a historically bad month for stocks. Many of the most dramatic crashes have begun during this month. 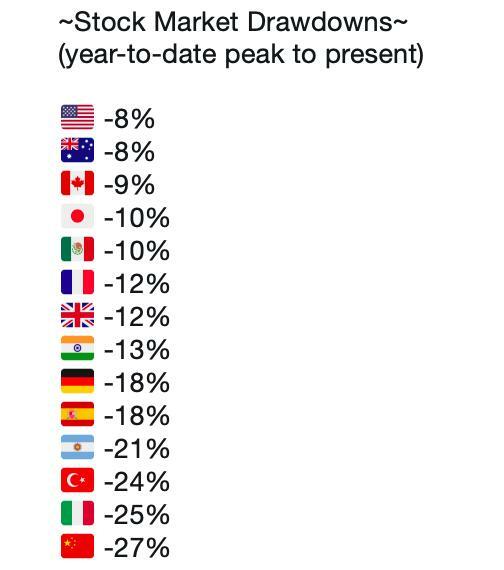 The global market crash of 2018 seems to be in line with this trend and the crash is indeed global. This same trend has occurred prior to other major historical market crashes, whereby other countries were already crashing and in depression prior to the crash hitting the United States. Nothing happens in isolation. This holds true between markets and throughout time. In February of this year, there was a huge stock market sell-off. What caused it? In short, the “smart money” was taking profits. Huge profits. Trading whales sensed that the top was near and decided to withdraw major portions of their funds. And looking back, it appears they were right. Over the next 8 months or so, “the little guy” began piling into stocks. This is a classic indicator of a true top being reached in equity markets. Falling victim to FOMO (fear of missing out), average retail investors pile into stocks when there has been such an epic bull run that everyone thinks the party will never end. Click here to read the full story on Iris.xyz. Will the Art World Fuel Ethereum to $500 This Year? Is Archrock Inc. (AROC) Stock Undervalued Right Now?